To kick off the baseball season, today's post is in homage to Gil Hodges, one of the game's greats. 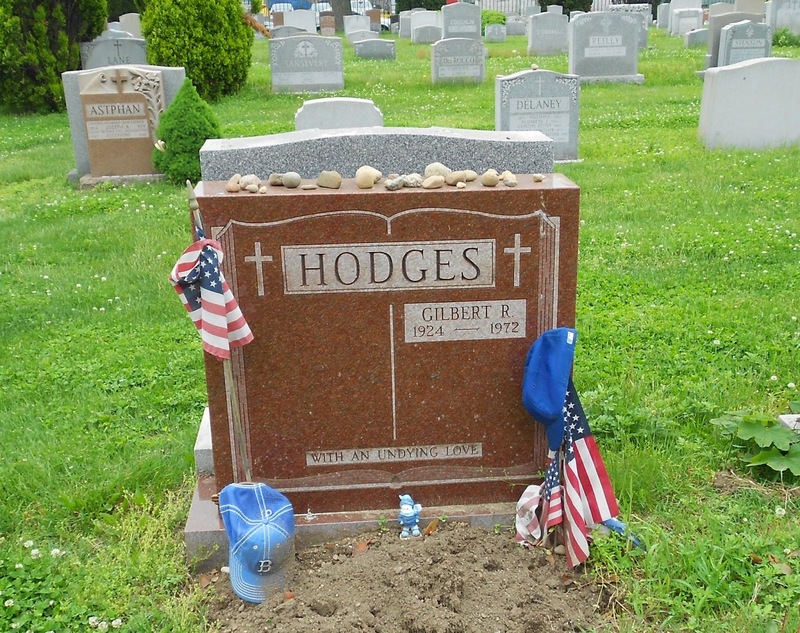 The grave of Gil Hodges can be found in Brooklyn's Holy Cross Cemetery. His grave is adorned with an American flag and baseball memorabilia left by visiting fans. The former first baseman for the Brooklyn Dodgers died in 1972, two days before his 48th birthday. Several days later, more than 1,000 people stood in line to pay their respects as Hodges body reposed in a Brooklyn funeral home. After two days of visitation, a Mass of Christian Burial took place at Hodges church, Our Lady Help of Christians, led by Bishop Francis Mugavero. Seated in the church, which was filled to capacity, were Bowie Kuhn, Jackie Robinson, PeeWee Reese, Tom Seaver and Mayor John Lindsay. Thousands more lined the streets. At the conclusion of the service, two flower cars overflowing with floral tributes led the cortege to Holy Cross.